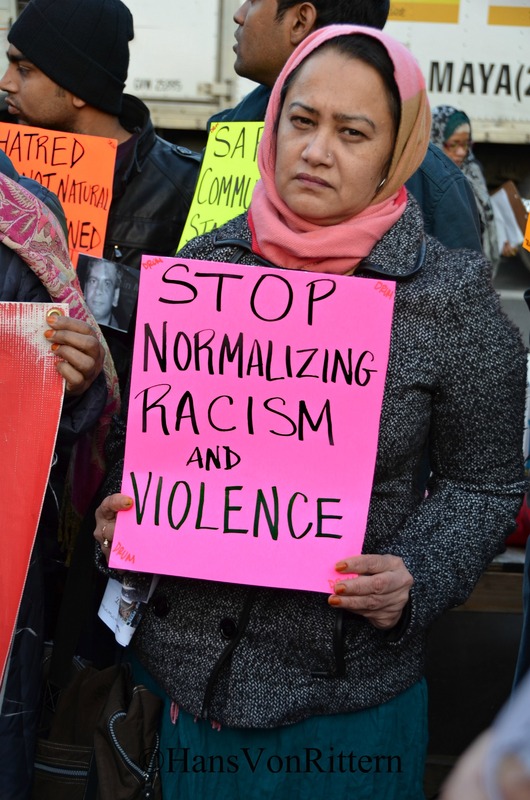 STOP NORMALIZING RACISM AND VIOLENCE: This is Mazeda Uddin, the National Women’s Coordinator for the Alliance of South Asian Americans. She and I attended a vigil in Jackson Heights to address incidents of racial violence, anti-Muslim, anti-gay sentiment and other forms of hatred in our neighborhoods. In light of the recent tragic death of Sunando Sen, an India immigrant, who was pushed in front of the 7 Train in Sunnyside for being “one of them”. Attending yesterday afternoon were Council Members Danny Dromm and Jimmy Bramer, members of Desis Rising Up & Moving, Council on American Islamic Relations and other community leaders and clergy to put an end to these heinous crimes. We are a city of immigrants. Immigration is what built New York, to turn on each other for our perceived differences is inexcusable. See my original post of December 29, 2012 to read the sadly horrible story of Mr. Sunando Sen.
Mr. Sunando Sen worked hard for 46 years and his reward: two candles and six roses. A woman accused of pushing a man to his death in front of a speeding subway train Thursday night, December 27th, in Queens has been charged with murder as a hate crime, New York Police Department spokesman spokesman Paul Browne. said Saturday.Police arrested Erica Menendez on Saturday after a passerby on a Brooklyn street noticed she resembled the woman seen in a surveillance video.Ms. Menendez told authorities she hates Hindus and Muslims, a spokeswoman for Queens District Attorney Richard A. Brown said. The victim, Sunando Sen, was from India, but it isn’t clear whether he was Muslim or Hindu, it doesn’t matter. The arrest capped a three-day search for a heavyset, 5-foot-5 Hispanic woman who was caught on camera escaping from a subway platform in Sunnyside, Queens, after she allegedly shoved a man into the path of an oncoming No. 7 train. It was the second such attack in New York City in less than a month. The seemingly unprovoked attack, the second time this month that a man was thrown to his death on the subway tracks, stirred some of the deepest fears of New Yorkers. The police identified the victim as Sen of Queens, a 46-year-old immigrant who had been raised in India and who, after years of toil, had finally saved enough money to open a small copying business this year on the Upper West Side of Manhattan. Ar Suman, one of four roommates who shared a small first-floor apartment with Sen in Elmhurst, said he was driving a client upstate when another roommate called and told him what had happened. Hoping the information was wrong, Suman raced back to the city, only to find that there was nothing he could do — Sen was dead. Suman said Sen was proud when he had saved enough money to open the business, New Amsterdam Copy. Since the shop opened, he had rarely taken a day off, Suman said. Police Commissioner Raymond W. Kelly said Friday that according to witnesses’ accounts, there was no contact on the platform between the attacker and the victim immediately before the fatal shove. He said Sen was looking out over the tracks when his attacker approached him. The attack occurred so quickly, with the train already barreling into the station, that the man had little time to react and bystanders had no time to try to help, said Paul J. Browne, the Police Department’s chief spokesman. Sen was hit by the first car and his body was pinned under the second car before the 11-car train came to a stop. Investigators released a grainy black-and-white video overnight showing a person they identified as the attacker fleeing the station and running along Queens Boulevard. She was described by the police as Hispanic, 5 feet 5 inches tall, in her early 20s and heavyset. She was reported to be wearing a blue, white and gray ski jacket and Nike sneakers — gray on top, red on bottom. The subway station was closed overnight as officers from the Emergency Services Unit used specialized inflatable bags to lift the train and recover the victim’s remains. The No. 7 line had resumed normal service by the morning rush. Sen’s roommates could not understand what might have led to the fatal encounter Thursday. Suman said that as far as he knew, Sen did little more than work and come home. Both his parents were dead, they said, and he was not married and had no children. Sen suffered a heart attack about nine months ago, Suman said, but did not slow down. The night stand in Sen’s bedroom had many bottles of prescription medicine. Across the room on his desk was a pile of medical bills. His roommates said he liked watching funny clips on YouTube to unwind, enjoyed a cup of tea and would relax listening to classical Indian music.